With coaching and guidance from you, students experience getting smarter—mastering new knowledge and skills faster and retaining it longer. Motivation and academic confidence soar. Our Handbook contains 10 assignments, which students master at their own pace, in class. You help and coach them individually, a minute or two or more at a time and moving quickly to the next student. There are no lectures to prepare, no tests to administer, and no papers to grade. 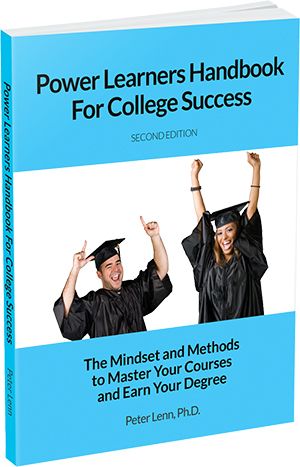 If you would like a free examination copy of our Power Learners Handbook for College Success and the accompanying Faculty Guide, please submit the above form.